On Columbia University’s Manhattanville campus. In the early 1990s, when I was a graduate student at Columbia University, I dreaded my nightly trudge home from Prentis Hall, a gloomy old milk-bottling plant on a grim stretch of West 125th Street. A sour wind whipped off the Hudson, strafed a McDonald’s parking lot, and gusted up into the subway viaduct, which dripped rusty water and pigeon guano. Twenty-five years later, Prentis, the McDonald’s, and the wind remain unreformed, but the streets and the bridge have been spruced up, and the block will shortly bloom into the entry point for Columbia’s gleaming new Manhattanville campus. 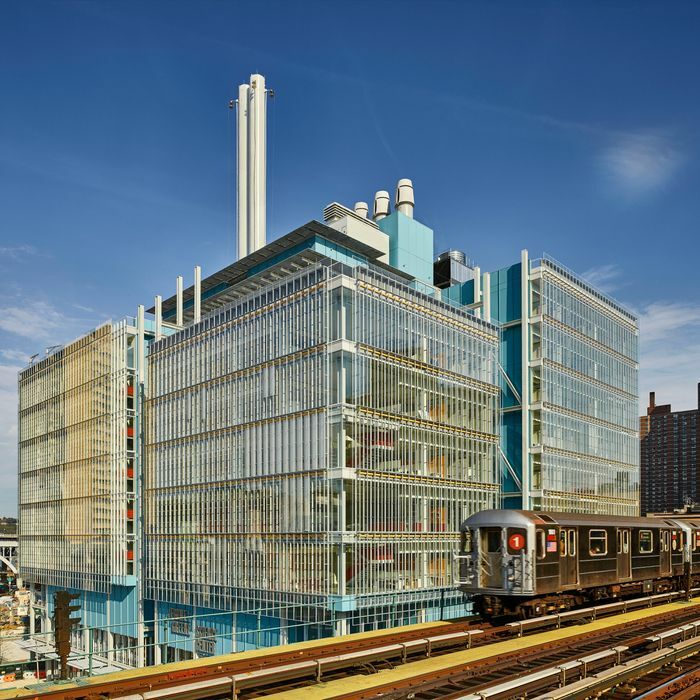 The Jerome L. Greene Science Center, designed by Renzo Piano, has already risen on the corner of Broadway and 126th Street, and it offers a preview of the university as a place without stone walls. New York finally has the Piano it deserves, a triumph of postindustrial classicism by the ultimate deluxe architect. More a craftsman than a visionary, he conjures steel membranes and glass scrims that seem to float free of their tethers. With beams as fine as pencil lines, he draws planes that seem flatter, volumes more graceful, and angles righter than anyone else’s. The first outpost of the new Columbia may not be flamboyant or novel, but it is one of the finest dull buildings you will ever see. 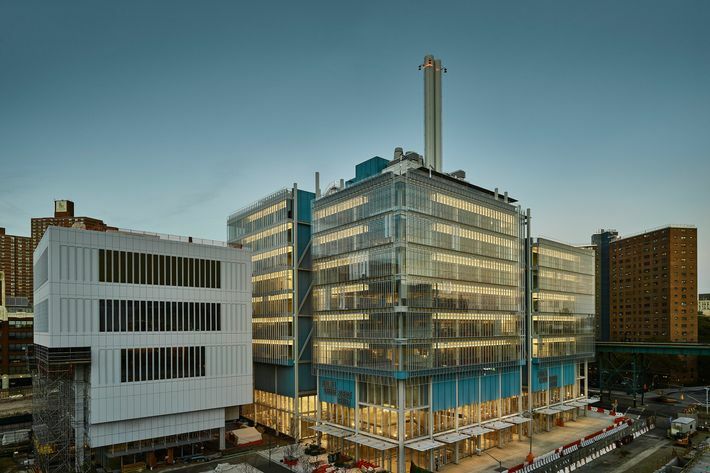 The Greene Center, which will house the Mortimer B. Zuckerman Mind Brain Behavior Institute, consists of four glass-sided blocks, trimmed in baby-blue aluminum panels and topped with a pair of smokestacks. The building takes pleasure in its gritty surroundings and holds itself apart at the same time. Bare steel beams, cables, and braces sing along with the filigreed subway viaduct that runs alongside. The elevated 1 train rattles past the labs, but the air cushion sandwiched between layers of glass keeps the noise to a low hum. In one of the few areas of Manhattan that still enjoy an abundance of sky and sunlight, the blemish-free façade reflects the passing clouds with such improbable clarity that they resemble an image projected on a high-def megascreen. Sunshine pours blindingly into the south-facing labs — or it will, anyway, until the building gets its second skin of automated shades. At times, the building appears to consist entirely of surfaces, with hardly any body at all. The roof terrace is screened by a canopy of thin steel grilles and enclosed by insubstantial glass railings. Interior staircases resemble stacks of floating wafers. Bright hallways flanked by red or orange lockers cut through the building’s core and shoot out toward invisible glass walls. Colors and planes form a lively counterpoint you might even call Pianistic. There’s more to come, not all of it by Piano. He is the author of the master plan for the whole 17-acre campus (slightly bigger than the whole World Trade Center complex), a white-box School of the Arts building that is nearing completion, and (along with the landscape architecture firm Field Operations) the all-important interstitial spaces where so much of a university’s life actually takes place. Next up is a triangular student forum; not far behind is a pair of Business School buildings designed by Dilller Scofidio + Renfro. The campus map shows placeholders for another nine future buildings, to arrive as needed over the next couple of decades. After years of being starved for square footage, Columbia will finally have the real estate it needs to compete in the global knowledge games — and its relationship with the city will be utterly transformed. In the 1890s, the university moved to Morningside Heights from East 49th Street, and New York’s most august architectural firm, McKim, Mead & White, installed it in a walled compound, an austere fortress of learning. Within its boundaries, they laid out an axial campus, full of symmetries and intentional perspectives. When you enter College Walk at 116th and Broadway and emerge from between Dodge Hall and the Journalism building, you get a view as artfully arranged as an opera set: wide steps, perpetually sprinkled with students and watched over by Alma Mater, the Pantheon-like Low Library commanding the heights, and a harmonious perimeter of brick and granite all around. Successive generations of administrators and architects have done their best to ruin that gracious composition. Fortunately, I.M. Pei failed to inflict a pair of twin towers on the South Field in the 1960s. Alas, the firm of Moore & Hutchins did manage to jam oversize, stone-faced Uris Hall into the North Campus in 1961, where it sits as awkwardly as a bouncer on a crowded subway car. (A renovation in the 1980s dressed up Uris with a new façade, the architectural equivalent of a fake mustache.) Columbia has built often and badly, haphazardly tossing new structures into open sites. More recently, the university has at least tried to live up to the standards of its prestigious architecture school, albeit with mixed success. 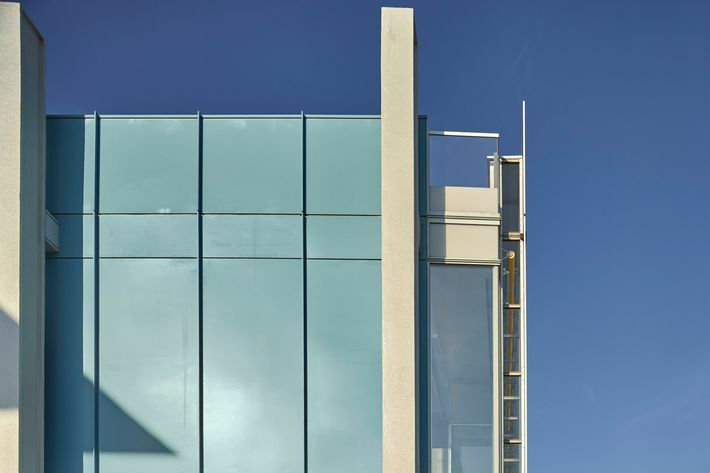 Rafael Moneo completed the campus perimeter with a steel-plated watchtower of a science building, making both the disciplines and the college seem even more impregnable than they already did. 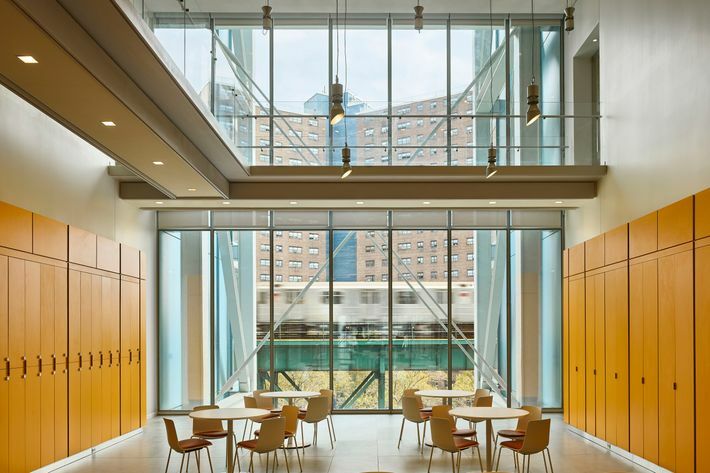 Way uptown, Diller Scofidio + Renfro gave the medical school the boldly inviting Vagelos Center, and Stephen Holl equipped the sports teams with the tough and lyrical Campbell Center. That was all prelude. Now the university’s president, Lee Bollinger, has the chance to get it right — not just to fill in gaps, but to develop the mission and the architecture in tandem and map out the next century’s growth. Bollinger didn’t want the university to add more satellite campuses, and so a ten-minute walk (which is practically a trek for students who measure their commutes in nanoseconds) leads from Moneo’s science building to Piano’s. In the lowlands of Manhattanville, Piano mapped out a new neighborhood by the river, a densely gridded wedge bounded by housing projects and viaducts. (The campus extends from 125th Street to 133rd Street, and from Broadway to Twelfth Avenue; Riverside Drive, Henry Hudson Parkway, and the No. 1 line all run overhead.) No gates mark off this Columbia from not-Columbia, and new structures enfold the old industrial holdovers like the Studebaker Building, an Art Deco brick behemoth topped with a tower and trimmed with porcelain froth. (For a while in the 1920s, cars built at the company’s plant in South Bend, Indiana, stopped here to be finished on their way to showrooms and driveways.) 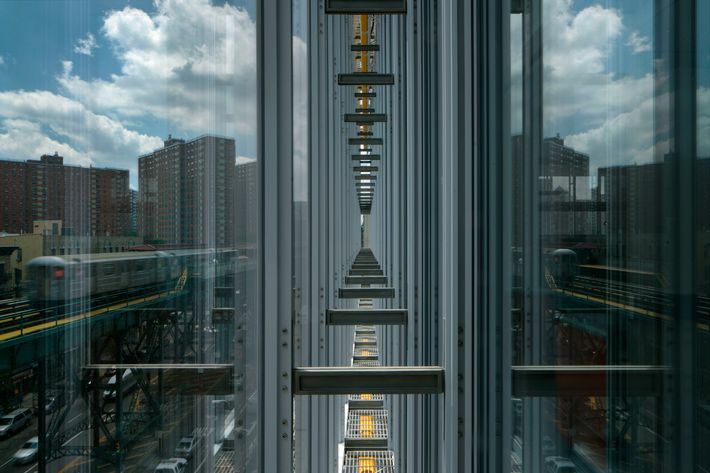 The new building invokes the legacy of that vertical urban factory, a composition in muscle and glass. Piano’s purism has not always worked as well in New York. He is at his best with freestanding buildings that sculpt not just the interiors but the surrounding space as well. In San Francisco, for instance, he effectively turned a part of Golden Gate Park into a velvet-green presentation pillow for the jewel that is his California Academy of Sciences. Manhattan rarely gives architects that much elbow room. At the Morgan Library, he stitched together a cluster of existing buildings around an airy party room, creating a new Madison Avenue entrance so understated that it almost looks temporary. The Times Tower somehow manages to vanish on the skyline, partly because he veiled it in a curtain of terracotta rods that peters out at the top in an oddly fuzzy crown. And at the Whitney, his industrial proclivities produced an ungainly machine, more Rube Goldberg than Mercedes. Columbia avoided these compromises by evicting neighbors and clearing the site, so that it could arm the architect with a wand and a (nearly) clean slate. The result is a Manahattan Pianoville, a mini-city so perfectly ordered and ruthlessly pleasant that by rights it should exist only in the mind.